I recently used this to transfer VHS to DVD and I was very happy with this unit. I'm not very good with stereo instructions, so between 2 short videos on a web site watching an elderly gentleman showing how to record and another on how to use multiple tapes or skip / format scenes on the same disc, as well as some instruction reading, this turned out to be a very simple machine to use. For those wondering, you can skip scenes if you want to jump ahead and that can be programed into the machine prior to recording and will work in other players as well. You have options in the menu settings, 5-10-15-minute jumps. It is already set to advance 10 minutes when you want to skip a skip, found out after the fact, but was pleased it did it. Also if you use multiple tapes, or jump scenes, which can be monitored while in the VCR portion of the machine to set the scene up, the disc portion will create a different Chapter due to the interruption, but the disc still plays fine. Be sure to read the instructions for the right recording disc to use because it will not use just any recording disc. This recorder combo does everything needed to transfer vhs, 8 mm, and dvd to dvd,s. It is easy to edit. You can switch from dubbing vhs to dvd to recording 8 mm to dvd and visa versa. The input connections on front and back allow you to switch from downloading camcorder t apes to front connections which can transfer dvd video, and built in vhs which allow to dubb in vhs video. This is the best option for editing, and cheaper than paying for transfer service. This is the 3rd unit I purchased. The first did not work and the 2nd was damaged. But ‘‘tis one works perfectly. I recommend you use pay pal or something else to guarantee a refund if you have problems. This was a refurbished (by manufacturer) device, quite old by now in design, etc. I needed to replace a device taken out by lightening, and wanted an inexpensive device that would paly DVDs, VCRs, and also that I could record DVDs from my video camera. I tested all of these functions and all work fine. I have not used it extensively, but I assume it will work for as long as I need it, unless lightening drops by again. I have had many Sanyo and Magnavox products and they always work well. 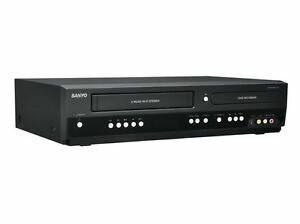 The sanyo vhs/ dvd player recorder works flawlessly with good image quality and easy use. The HDMI connect is perfect. Makes setup a breeze. Overall good product for the price. Very lightweight, ample choices on hook up and is so very easy to set up using one simple USB cord. One touch recording makes it so easy to transfer from VCR to DVD. Meets all of my needs.